Eat my heart » Blog Archive » Coucou! “Coucou!” That’s what the French say upon entering a room unexpectedly. It’s like saying hello, here I am, good morning, good afternoon, wake up and put your pants on, I’m coming through. It’s a greeting and a warning all at once. I’m back in France with the FC, taking a much-needed break from the house renovation. Tonight the FC is attending a bachelor party for a dear friend and I’m alone at his parent’s country house in Wambrechie, a small village in the north of France. Though it was gloomy and overcast, I decided to cure my restlessness and go for a walk. As I strolled down the lush wooded path to La Deule river, a cuckoo bird starting calling. Coucou! Coucou!! The sound was so clear and pronounced I was afraid it was someone hiding in the bushes pretending to be a bird. On edge, I arrived in the lonely town square where a gang of French boys implored me for a little smile. “Un petit sourire Mademoiselle? Un petit sourire?” Frightened, I quickened my step and headed straight back to the house. Now I’m here, in the FC’s childhood bedroom, writing this post. “Coucou!” It’s not just a hello, it’s a warning. It’s also time passing. And madness. I suddenly find myself afraid and full of questions. What am I doing here? Why does the FC love me so much? And more importantly, when will it all come to a spectacular and catastrophic end? 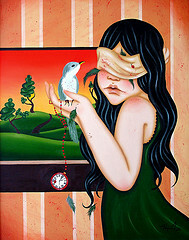 Title image is “The Cuckoo Bird” an oil painting by Meghan Trice posted on Flickr. This entry was posted on Saturday, May 8th, 2010 at 5:00 pm	and is filed under Uncategorized. You can follow any responses to this entry through the RSS 2.0 feed. You can leave a response, or trackback from your own site. Trust your instincts, your intuition, and your heart. Self doubt can be a form of madness. Why does the FC love you so much? Simply because you are very lovable. Charming, witty, smart, beautiful, with a rare inner glow that draws like a magnet. Enjoy what you have now, for it’s guaranteed to change. Such is the nature of life. You will stay together and grow with the challenges of the changes because you have such a solid base and attraction now. It will just keep getting better! Gosh Peter. You are sweet! Hey, how’s that essay writing course going? I want to read what you’re up to? The essay writing course went very well. I missed some classes due to traveling but managed to get an acceptable 76%. It was a wonderful class and really made me appreciate the art of writing and how difficult it is to be good at it. The next course,a science elective during the summer, is “Flora of Northern Ontario”. it will mostly entail going out in the field and collecting and identifying plants. I can’t think of a nicer way to get university credits than that! Leave the coucou to his signing and go on! I’m over it! Just a fleeting moment of evening weirdness. Grandpa Europe’s giving me the love now.